Michelangelo Buonarotti, the great Renaissance artist, is justly famous for magnificent sculptures: his David, Moses, Pieta, and others. What is not as widely known is that, starting early in his career, he went to the marble quarry at Carrara, Italy, to personally select the stone for each new statue. (Most artists left it to someone else.) I am sure that a significant factor in his success was his ability to pick out the marble blocks with the best potential. The purpose of this checklist is to help you learn to pick out the trees and shrubs with the best bonsai potential. I made up the checklist for club members visiting general-purpose nurseries, but the guidelines apply any time you are selecting raw material for bonsai. Why shop for bonsai material at a general-purpose nursery? The primary advantage is cost: you can save 50%, sometimes more, compared to what you'd pay for equivalent material in a bonsai-dedicated nursery. But there is a flip side to the coin: you must invest time, carefully looking. One good find out of 100 plants evaluated is a good success rate, in my experience. But that one can give you a tremendous feeling of accomplishment! A number of different men have taught me these principles over the years; but the one to whom I am most indebted is David DeGroot, author of Basic Bonsai Design. I recommend the book without reservation. This material is intended to fit onto two sides of a single standard sheet of paper; you may have to tweak the formatting for your own word processor. I suggest that paper then be laminated, so it can be taken into a garden center without fear of damage. Please do not remove the acknowledgment to David DeGroot, or my signature line. No restrictions on non-commercial use. Does the nebari look stable? If not, will tilting help? Are surface roots evenly distributed, or at least balanced side-to-side? Are the strongest roots opposite the direction of primary trunk movement? If the first set of roots is not good, is there a second set below? If there’s no real nebari, can the widest point of the lower trunk be the tree’s base? Red flags: Tangled, crossing, or coiled roots. Is there consistent movement from the base up, lending itself to just one basic style? Is the trunk short enough for a good height-to-girth ratio? If not, can it be shortened? Is there a gradual, believable taper? Are there enough internodes for branches where you need them? Do internodes shorten, and get closer together, from the tree’s base to the top? Are the texture and color of the trunk uniform along its length? Red flags: Reverse taper and knobs; changes of movement drastic enough to no longer fit the intended style. Are there enough of them where you can use them? Are they smaller and closer together towards the top of the tree? Note: On a non-conifer branches can be removed and re-grown, but on most conifers this is not an option. Does the base look wide and stable? Is the trunk movement consistent up the length of the trunk? Is the movement interesting? Are features like jin or a hollow trunk easily seen? Note: Choosing a front usually involves compromise, and weighing the pros and cons of different alternatives. Are there any defects serious enough to disqualify the tree, and that cannot be hidden, removed, or made use of? Are there more desirable than undesirable features? Can you live with the latter? Can you, in your imagination, picture a blended, harmonious whole? Be flexible. Learn to look at all of a plant’s features, and all the options it offers. Line: expressed by the movement of the trunk. Sets basic style. Helps tell a tree’s story. Form: expressed by the branch structure. Sets any style variation. Tells much of the tree’s story; also indicates age and condition. Texture: shows age or youth, grace or strength; tells of the tree’s health and condition; contributes to visual unity. Color: indicates health and condition, as well as “mood” of the tree. Proportion: the parts of a bonsai should be in scale with each other. Balance: not necessarily symmetrical, but visually balanced overall. Unity: design consistent with itself, forming a self-coherent whole. Nebari and base are most difficult to change, and change takes longest. Trunk is next most difficult to change. Branches are easiest to change and change comes most quickly. Classic ratio is 6:1. Anything from 4:1 up to 8:1 usually works, tho the higher the ratio the younger the tree looks. Doesn’t apply to bunjin. Primary branch’s girth should not be more than 1/3 trunk girth at point of separation. Generally accepted guideline. Nebari: Japanese word for a tree’s surface root structure, which forms an important part of a bonsai’s image. Basal flare: widening of the trunk at the point where it enters the soil. Common to mature trees. Internode: the space between two nodes, the points on a branch or trunk where one year’s growth stopped and the next year’s began. Common site for branching, especially in some conifers. With Grateful Acknowledgment to David DeGroot, now curator of the Pacific Rim Bonsai Collection, from whose book Basic Bonsai Design much of this information has been derived. 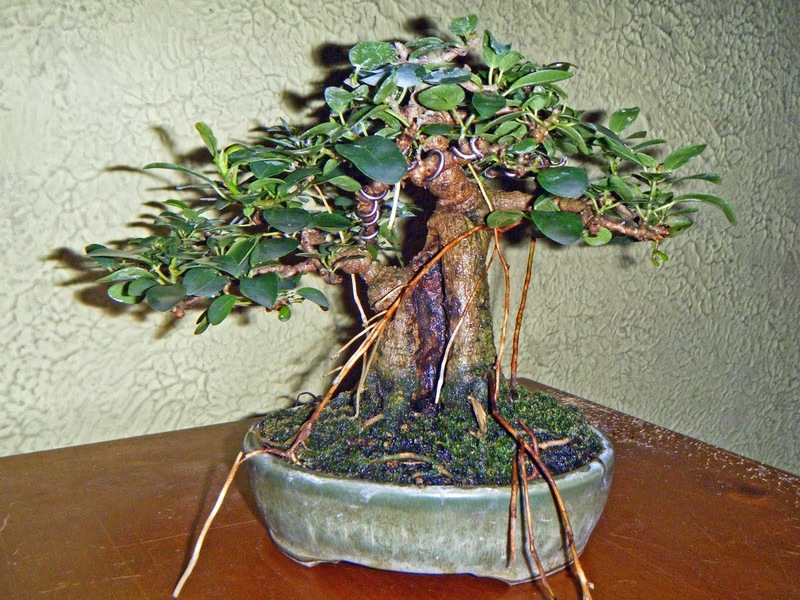 Basic Bonsai Design is published by the American Bonsai Society. -- Steve Moore; Warsaw, IN; June 12, 2012; "Bonsai in Hoosierland."